With the ever escalating price of printer ink, and the decreasing price of printers, you can now buy a printer for the same price as the ink. To prevent anyone doing so however, some printer companies have replaced the full set of ink included in previous times and compensated with ‘starter packs’ containing miniscule amounts of ink, forcing the user to buy a new pack after printing a few pages. Take the Advent Touch Wireless All-in-one inkjet printer. At £29.97 you obtain a whole new printer, along with a full set of ink. For £8.01 on top of that you get the ink and nothing more. It just doesn’t add up does it. 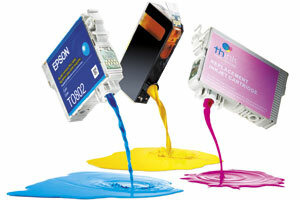 Consumers can counteract the steep replacement ink prices by going for second- hand/refilled cartridges, though even this has been made increasingly difficult as modern printer companies have created an electronic chip within ink cartridges that decides if the cartridge is empty and if so, renders it useless. A similar issue arises with printers that employ colour cartridges as a set as opposed to singular: when one ink colour runs out, the printer will no longer acknowledge there is any ink left at all. A new one is ‘XL’ ink packages (that contain a bit more ink/value) in place to sell cheaper printers thus recouping the money on low-ink cartridges, which consumers then have to replace more often. Simultaneously as the price of ink heightens, the size of it is lessening. Let’s take the HP 21 XL for example. RRP of this product is £25; containing 12.5ml of ink; a page yield of 475, working out to 5.26p per page printed. In 2002, the HP 45 XL contained 42ml of ink for £20 (2013 RRP £34), capable of printing 930 pages: 2.15p per page. This does however highlight there has been an advance in technology so printers are now more capable of using less ink to fulfil the printing requests of the user. In an office, you’d probably be after a colour laser printer. The Samsung CLP-415n is £174.00 at Staples* or £151.66 at C-L-P**. They both come with CMY toner with a page yield of 700 pages and black toner with a 1000 page yield. CMY toner is not available for purchase so the consumer must buy these toners separately thereafter: £70 each that print 1800 pages. The black toner is £69.00 and prints 2500. The price of a new full set of ink is £279, with the printer at £151.66, the difference is £127.34. By buying this printer, you are effectively receiving £55.60 worth of ink that will print you over 1000 pages- it’s 2.5% less than purchasing ink but it seems like a pretty good deal. How about Managed Print UK? It’s ridiculous how they can help you save money in the long term. It is a fixed price solution that allows hassle free printing- eco friendly too whilst supplying all of the hardware, supplies and advice you need to guide you through. But then again, maybe the best solution is to buy a printer you like and maintain it; quality is more important after all. Another thing to consider is the environmental effect caused by buying multiple printers v. new ink. Furthermore, how much your printer is used and what for- exploring and researching the entirety of your printer options will definitely ensure you save money in the long run.